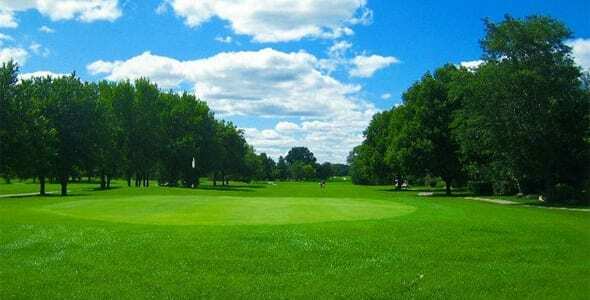 Located right off I-55 in west suburban Darien is Carriage Greens Country Club. This wonderful golf course offers 18 magnificent holes of pristine beauty. They are challenging yet fun to play for everyone, the beginner and experienced alike. Carriage Greens Country Club features a number of interesting doglegs carved through dense trees, placing a premium on ball position. What’s unique about this layout is you’re forced to hit both draws and fades on a number of holes if you expect to attack the greens. The 384-yard par 4 ninth hole is a perfect example of the premium placed on shot-shaping at Carriage Greens. Hit a strong draw off the tee and you have a great shot at a favorable green. However, if you come up short or get caught in the woods, your options become extremely limited and bogey now becomes your friend. Carriage Greens Country Club offers the Sandtrap Grill with brunches, lunches and dinners. It has some fine wine and cocktails to also partake of. This is also a great place for a wedding reception or business meeting.